Remember that old song by Queen, I'm In Love With My Car? Well it's kinda like that. In the early 1980s I used to press my nose against the window of computer stores and yearn for an Apple IIC or an Apple III. Then came January 1984 and the unveiling of Macintosh during the Super Bowl half time. I could see right then and there my destiny as a crusader for free thought. Three years later I finally had enough money to buy my first Mac, a Macintosh Plus, and I was immediately enthralled with the vast power at my disposal. 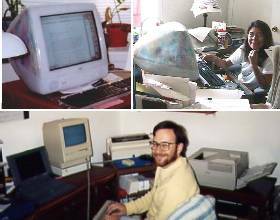 In 1994 I bought an Apple PowerBook 150 and took it to Peru with me to do writing and research for my dissertation. In March 2001 I bought my third and current Mac: an iMac "Flower Power" edition, and once again I was in MacNerd heaven. All three of my Macs still function, and I have no plans to dispose of any of them. I don't expect long-term Windows users to understand, but I know there are plenty of Mac folks out there who know the joy: Macs rock! No automatic redirect? Please click HERE to go to the new Macintosh & Miscellaneous blog page, as explained below. Mac users: smug or persecuted? In last Thursday's News Leader, Fred Pfisterer shares his experience as a proud, satisfied Mac user coping with the bigotry of the cruel Windows-dominated world. Do we act like we are [a persecuted minority] some times? Well, you'd have to "walk a mile in our shoes" to understand. After suffering the indignity of PC techno-nerds spouting condescending jargon, Mr. Pfisterer opted for the "kinder, gentler alternative" of Macintosh. Once you go Mac, you never go back! Even though the Macintosh had established itself as a clearly superior platform by the early 1990s, millions of computer shoppers around the world let pushy geeks sell them Windows PCs against their better judgment, and the rest is history. After 22 years, the advantage to using Macs is a strong as ever: As Mr. Pfisterer says, you just plug it in and you get to work; no muss, no fuss. Viruses, Trojan horses, worms, or constant crashes? Not with Macs; well, hardly ever. * Mr. Pfisterer had previously written about putting family photo albums onto CD-ROMs, which I have also done; see Jan. 17 [corrected link]. Coincidentally, there was a very rare news report last week about a a virus that targets Macintosh computers. It apparently only spreads via instant messaging (iChat), however, so I'm safe. See techworld.com (via MacAddict and Washington Post [corrected link]). I've updated the format of the Macintosh page for the first time in several months, with a new photo montage and few new links. I need to catch up with recent developments in the wake of the release of the first Intel-based Macs, which seems to be a mixed blessing.